I ve heard it many times, Glocks are not good on cast bullets, i have also heard that if you stay within the perimeters and clean your barrel you have nothing to worry about. I own 2 Glocks both 9mm (G19 gen5, G43). My COAL is 1.075 on the G19 which i will use on the G43 as well. 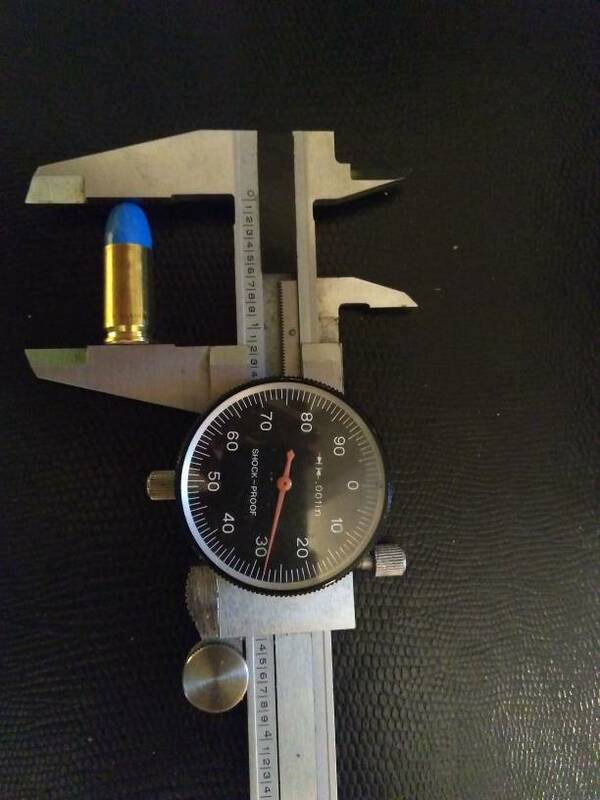 I am using the Lee 356-125-2R bullet Mold. I Powder Coat using Eastwood Mirror Blue Powder. My Lead Hardness is BHN14-16. I need inputs on a good start charge to work from and I don't know where i can get decent help. I ask for some guidance in this Great hobby. Thanks for your time. Glock also recommends to not use reloads in their firearms either....they'll be fine...neither of mine seem to mind. Both g17 (gen 3 and a gen 4) gen 3 has prob 25k cast loads down the tube? No issues. You'll see leading just as with any firearm if the size isn't right...slug the barrel to confirm what your diameter needs to be. Thank You John, What would you suggest my low load would be if I'm at 1.075 coal? Im thinking starting around 3.3 0r close to that. Winchester has only a 3.6 starting load for coal 1.125. I am set so deep it is hard to judge without testing. so you have a 356-125-2r bullet mold also? Sure do, have alot loaded in my range bag currently..with Eastwood Ford light blue ...let me go check the coal on it. Coal I have is 1.128 ymmv. Do the whole black sharpie plunk test to see what oal and taper crimp your barrel needs to pass the plunk test.. I do not have that boolit, so my AOL would not help. FYI, I had a real hard time getting 9mm boolit loads to work in my boy's glock. My hardest gun ever to get leading free boolit loads. Eventually ended up with a bigger than normal expander and 0.358" PC coated Lee 120's truncated cones. My high volume "target load" is 3.9 promo. My hotter load is Titegroup at Hodgdon book max for a 120. Both shoot great with no leading. for 9mm I had to throw coal out the window. have 3 or 4 9mm's and the coal is different in all of them, found a happy medium and went with that. when I loaded to the coal in the recipe book they would not load in some of my 9mm's. some worry that moving coal back will raise chamber pressure to much but I don't fill the case clear full of powder so moving the coal back a fraction did not compress any powder and I have not noticed any problems. when i plunk test the barrel on my 43 it works great with 1.110 with wiggle room (spin round in chamber) also feeds, and ejects fine, but not the case in my G19. have to drop down 1.075 for that to happen in as the G43. The bullet is so blunt round it hits the lans and inside barrel so it will not spin or feed correctly. That why I'm thinking drop the charge from 3.6 down to 3.3 or 3.4. Again winchester load data says 3.6-4.2 with coal 1.125 . Im just not sure. What is Black sharpie plunk test? John what is you Coal on you 9mm Glock using the Lee 120 TC ? That bullet might work better and put the Coal close to 1.110 or higher. I just checked my Lee 120 TCs & found that I load to 1.105" OAL. This has the case mouth fully covering the lube groove. I do seating and crimping (actually more flare removal) as separate steps. When I tried to do both at the same time with 9mms, I tend to get some shaving of lead/coating. Shaving can result in lead accumulation at the front of the chamber. This in turn causes failure to fire when a round does not go fullly into battery. Last edited by P Flados; 09-13-2018 at 02:05 PM. That bullet is a royal PIA the 124-2R is a way better choice or the 120 TC. Stop fretting over Glock leading Iv shot 10's of thousands of rounds out of my 34's and have never had a lead build up in chamber area if it chambers it shoots enjoy your range time.